Will do. :) I'll be selling dino grab bags soon. I bought that same flower tin in a different size for a dollar last weekend! how cool!!! I agree about flee market prices compared to good will. Its hard for me too! Great finds. 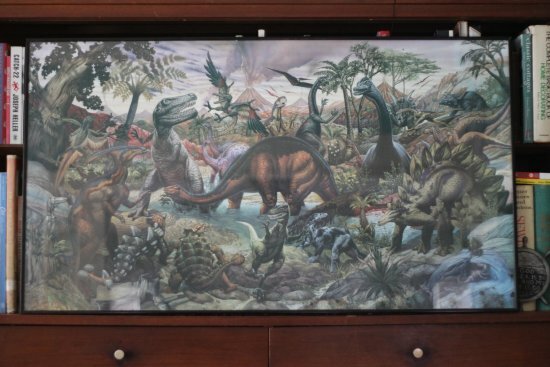 Love the dinosaur print, it would have be awesome to have when my kids were younger and so into dinosaurs. Karen: I may be nice and give it to my niece and nephew if they really want it. I haven't outgrown the childhood love for dinosaurs! My two boys would have been jumping up and down over that dinosaur print! Nice finds. 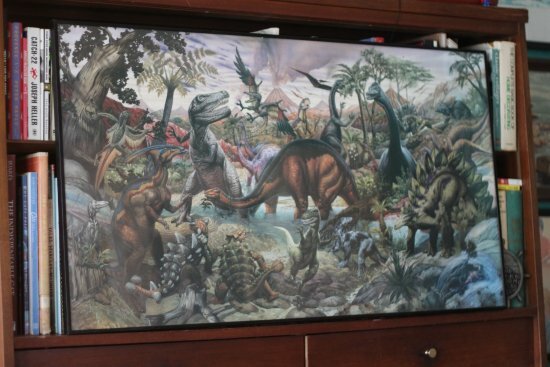 Deana: It's a beauty, and you just don't see this kind of cool dinosaur art anymore! Cara: Let me know if you're interested, I'll give you a great deal ;) I can't resist good plates, but it's just me here so I can't keep them. Great haul! Love the dinosaur picture soo much!!! 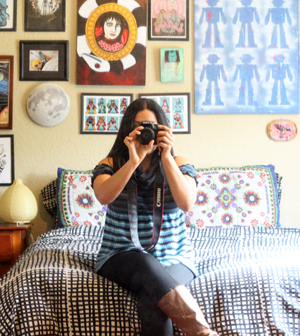 i posted my finds in my blog today too. cb & The Recyle-ista: Thank you! Off to check out your posts, now! Wow, it's great that you've found those specialty large toys! 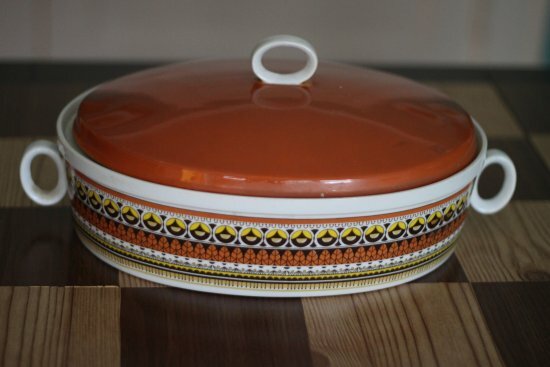 the plates and that pyrex is AWESOME. I found nothing as nothing is open on weekends and gsales are sad as.I am loving the dinosaur print I know 2 little boys that would love it. 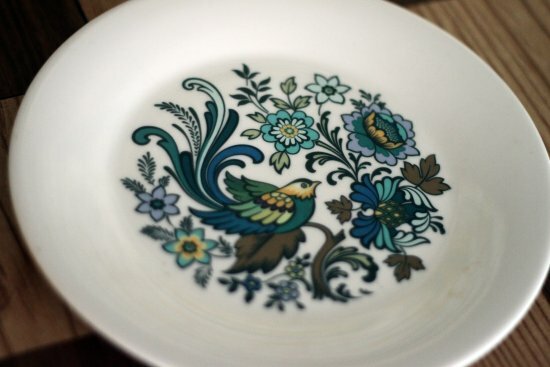 swooning over the bird plate!! love it! 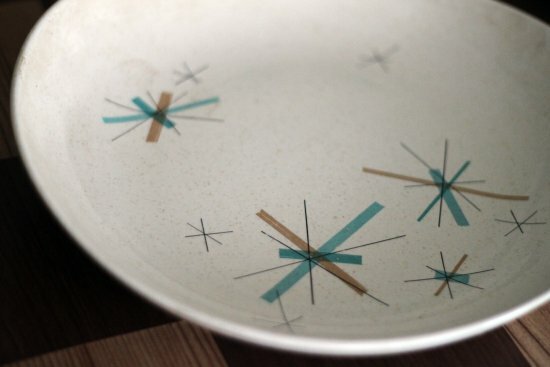 For the record, I'm in love with the blue bird plate. 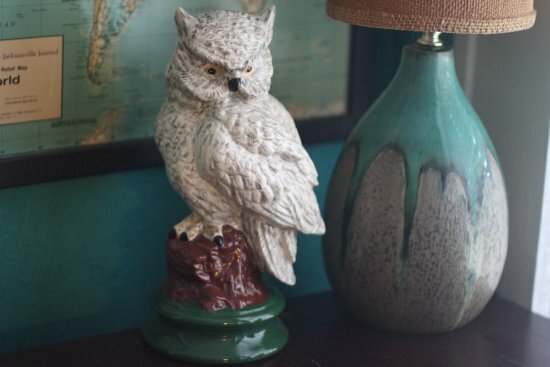 My brother went to the thrift store without me one day recently, and he came back with a ceramic owl statue. He knows I have a soft spot for owls (though I'm becoming more and more particular about them since they are everywhere). To me, though, the owl looked angry and scary, so gave him a makeover. When I posted a pic on Facebook, a couple of people said I ruined the owl, but I rather like him this way. He's dressed and ready to go to an Elton John Concert. Oh well, can't please everyone! Lori C: Eek! Don't do it! So many people want to buy that lamp off me, I need to find more like it to sell! And Dani, I LOOOOVE the owl makeover. 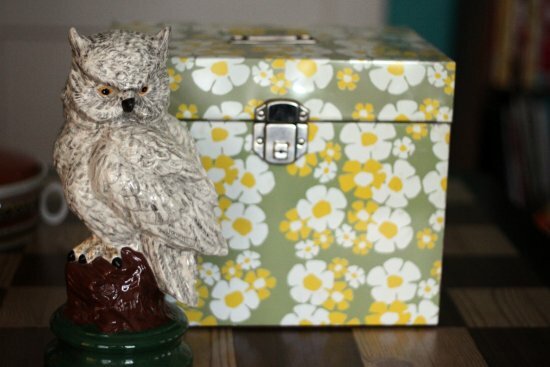 I've been planning to paint vintage goodies bright colors, too! The dinosaur picture is the best find everrrrrrrrrrrrrr!! I love it!!!! oh yeah and the first plate was super cute!! Kati and Bit of Butter: Thank you! It hangs in my office/dining room space now where it fits perfectly. It makes me feel like I'm in a library, it's lovely. Oh owls and dinos! That's a nice pairing right there. 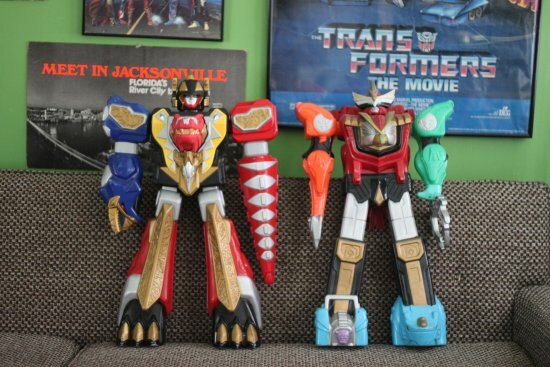 Wow, those megazords are awesome!